In an earlier post, I point out that the Alfred E. Neuman face and catch phrase originated from the advertising poster for The New Boy, a stage play that was first performed in 1894. The changes in the wording of the original phrase from “What’s the good of anything? – Nothing!” to “Me-worry?” and “What – me worry?” may have been further influenced by the “I should worry" craze of the early 1910s. Isch Gabibble - I should worry? So say the lyrics to a hit song from 1913, Isch Ga-Bibble (spelling from the published sheet music; Isch ka Bibble as spelled on the record label of the recording by Ed Morton), words by Sam M. Lewis, music by George W. Meyer. 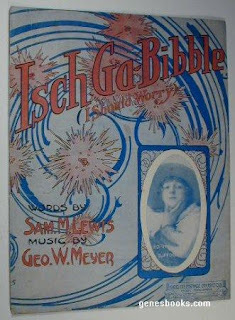 The song introduced the faux Yiddish gibberish word, ‘Isch ka Bibble,’ in all of its variant spellings, into the public lexicon. The phrase would reappear in the 1930s as the name of a comic character on Kay Kyser’s Kollege of Musical Knowledge radio program. Isch ka Bibble’s English language ‘translation,’ “I should worry,” entered the popular lexicon in an even bigger way. “Isih ga bibble?" “Whaddyemean. 'Isch ga bibble?’” asked the Germans who live in Germany when American tourists "pulled" the phrase during their wanderings in the fatherland. "It's German," responded the tourists. "Don't you know your own language?" Now, Germans, as everyone knows, are a serious-minded people. So they began to think that maybe they didn't know German after all, and grew worried about it. As the tourists journeyed the phrase spread, and pretty soon the whole empire was wondering about "Isch ga bibble." Finally, a German newspaper decided to settle the question, once and for all. So the other day Dr. George Barthelme, Washington correspondent of the Cologne Gazette, received a terse message from the home office, something to this effect: "Probe Isch ga bibble. Americans here call it German. Rush details." There is a saying common among German Hebrews meaning about the same thing as "I should worry " The saying is: "Nlsch gefiddellt." In a Hebrew theater In New York one of the comedians "put across" the line. An American song writer in the audience heard it, didn't understand the correct pronunciation, and wrote It down the way it sounded to him. "That's the way it ought to be. anyhow." he remarked. So he wrote an "Isch ga bibble" song and It went all over the country, and everybody shrugged their shoulders and said "Isch ga bibble," and It got back to Germany that way. And now that Dr. Barthelme has found out what it's all about the German mind will be relieved and everybody will be happy, and will say- "Just like Americans, nisch gefiddellt", and the Americans will keep right on saying "Isch ga bibble." Whether a ‘mistake’ or intentional, the word stuck and helped elevate “I should worry” into a national craze. “I should worry” seems to have been an example of what we would now call a meme. It was considered a dismissive, sarcastic, snarky remark, along the lines (as best as I can tell) of today’s “yeah, whatever” or “I could care less.” Although the "I should worry" fad seems to pre-date the song, the song lyrics illustrate how the phrase was used and may have helped propel the craze even further. London’s hotels and lodging-houses are filled to the skylights with blooming Yankee tourists. Never before has the city welcomed more travelers who say, “I should worry” and gnaw pepsin gum and demand the baseball scores by cable. The Day Book (July 26, 1913). I think the man who invented the slang phrase, “I should worry,” almost deserves a Nobel prize. The mere fact that almost everybody in the United States is saying this little derisive sentence over and over to themselves daily is a sure sign that a great many of them will begin to understand that worry is the most foolish of all the unnecessary things with which women torture themselves. The Day Book (May 20, 1913). Dr. L. K. Hirshberg of Johns Hopkins University agreed with the Good Witch; he prescribed repeating “I should worry” fifty times daily, loudly and with conviction (increase dose as needed), as a cure for chronic worry. 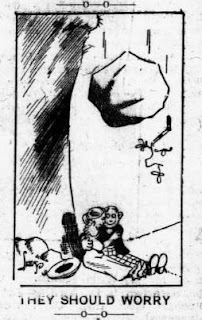 The Salt Lake Tribune (May 11, 1913). Harry Stuff filed for copyright protection for his "Eternal Optimist" or "Me - Worry?" 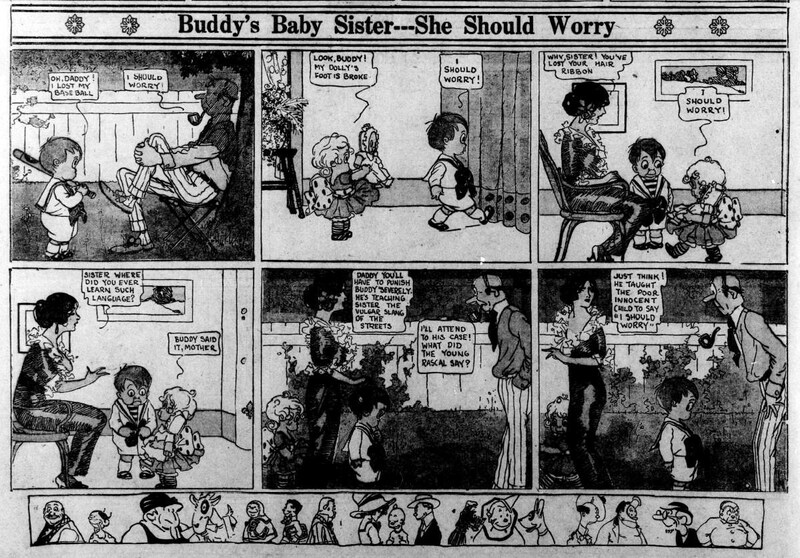 image in 1914, at the height of the "I should worry" craze. Although the image was likely based on or inspired by the earlier poster for The New Boy (as discussed in my earlier post), the rewording of the phrase to "Me-Worry?" (or "What? 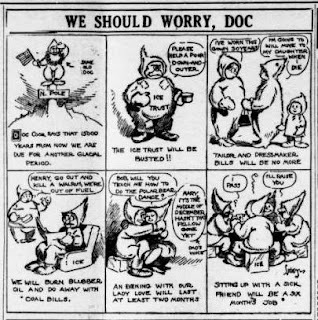 - Me Worry" as it appeared in later iterations of the image) seems to have been influenced by or was part of the "I should worry" craze of the early 1910s. Harry Stuff’s image was the subject of a law suit in the 1960s. Harry Stuff’s widow sued Mad Magazine for copyright infringement. Mad Magazine prevailed. Fascinating. I've been researching the 1913s & 1914s and have found a lot of "Isch ga bibble" references. Your blog posts intrigue me! Great work with a now somewhat obscure reference, but one my parents used frequently...takes me back - thanks! When I was a kid I saw an old slot machine at an antique place with Alfred E Neuman faces as we'll as fruit and jackpot logos. It was way older than Mad magazine or comic.That kid was a relic of old days. They used to use him on advertisings in the Victorian age. I love what Mad did with the character over the years but it kind of bothers me that they could copyright it. I mean it bothers me a very small amount. 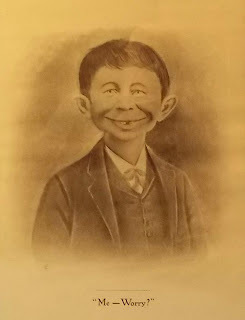 Who is Alfred E. Neuman?